The CSS Casket Saw and Router is designed to cut sides or ends of a casket, including the top and bottom mouldings in one operation. Two saw modules including two saw motors each, one to trim and one to score the groove. The trim saw can be adjusted in two positions, either vertical or at 45 degree angle relative to the vertical. Each saw has a dust collector hood. 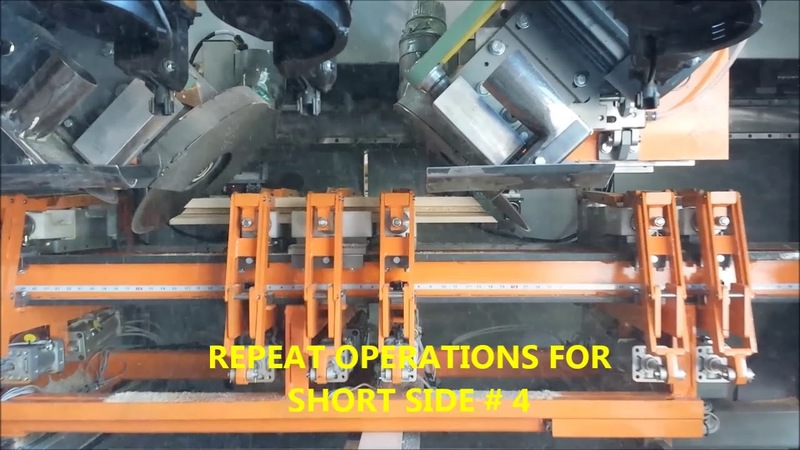 Six laser lights show the position of the trim cut on the casket components over the assembly area to help the operator place the part properly according to the cut position and also to show the area where no adjustable hold-down jigs should be located. The adjustable module positions respond to the dimension keyed in by the operator on the HMI, in reference to the center of the part. A mobile assembly table to hold the top and bottom mouldings to the casket side, including multiple pneumatic hold downs and assembly jigs. Two 3-axis machining spindles to mill the lock fixture recess. Two 1-axis machining spindles to mill the corner recess. A traverse beam with linear rails to support six carriages for nailing guns. HMI touchscreen, with parameters saving capabilities, allows to key in parameters for a production lot.